In 1996, I first took refuge (formally became a Buddhist) from Bardor Tulku Rinpoche in the Karma Kagyu Tibetan tradition. I now practice with the Still Water Mindfulness Practice Center in the tradition of Thich Nhat Hanh. I’m a lover of books, quilting, Bollywood movies, and Korean historical dramas. I majored in anthropology and minored in religion before getting my law degree. I live in Maryland with my husband Kirk, our two children, and one surviving cat. 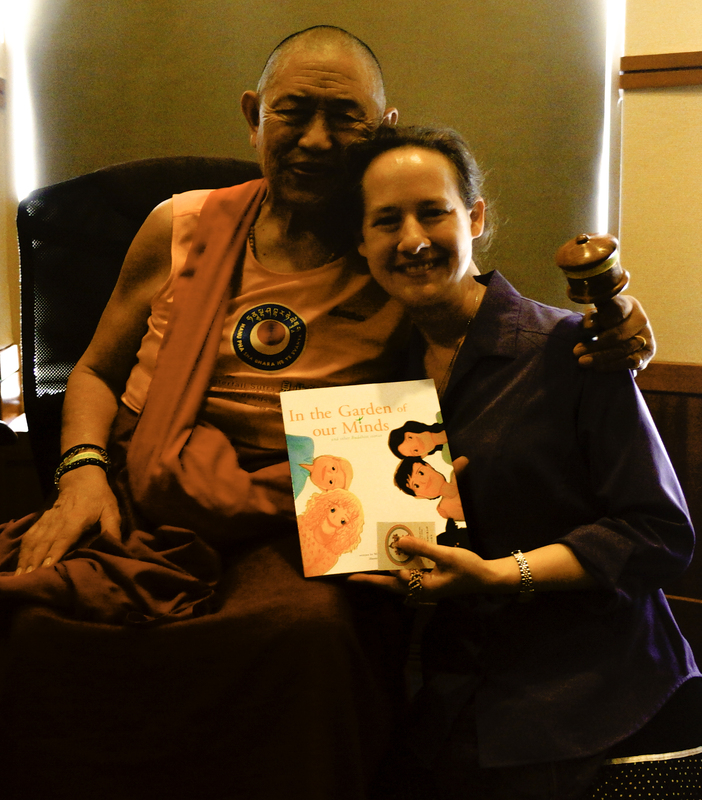 I wrote the children’s book, In the Garden of Our Minds and other Buddhist stories, based on my experiences of sharing Buddhism with my children. Kirk and I write fiction as K.M. Johnson-Weider and publish on Amazon.com through our company Blue Moon Aurora. So far we’ve published two novels in the West Pacific Supers series (Rising Tide and Victory at Any Cost), a science fiction mystery thriller (Black Throne Conspiracy), and a fictionalized memoir of adoption (the truth about Hannah Rose). For more information, visit Blue Moon Aurora’s main website. What does being Buddhist mean to me? Walk carefully – life is everywhere. Speak carefully – it is so much easier not to say something than to take it back once said. Think carefully – try to see the other’s point of view because at some point, I have had a similar view. Consume mindfully, because everything I bring into my body and mind influences who I am and what I do. Realize that even the worst people are ignorant, not evil. Realize that what I have done before has gotten me this far, but what I do now determines where I will go. Maybe in my last life, I was the cat and the cat was the human. Maybe in my last life, the cat was my child. Maybe the cat was my mother. The cat has feelings too. So does the cow, the chicken, and the fish. They all understand kindness and they all feel pain. Perhaps I can’t stop the suffering of all sentient beings, but I can minimize the suffering that I cause. If I can’t help, at least I can strive to do no harm. Be calm – things change. Strong emotions are like clouds across the sky. Sometimes there is a thick cloud cover and you can’t see the sky, but it’s still there, unchanged by the clouds. In the same way, even strong emotions that seem overpowering will eventually move and change. What counts in the end is the strength of our clear blue sky nature. Smile more! The present moment is the only moment you really have.